If you are looking to post a job within LinkedIn but are unsure how, or are you looking for some best practices when posting, you’ve come to the right place. Primarily in this piece, we’ll be covering how to post a job in LinkedIn Recruiter, our flagship recruiting product. However, users who don’t have LinkedIn Recruiter license can still post a job on LinkedIn by following these simple instructions. 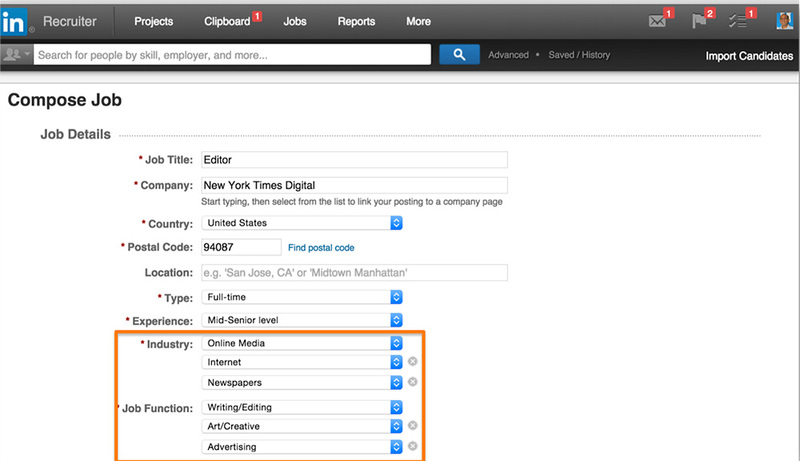 Hover over that option, and select “post a job” from the drop down menu. Once you click that button, you’ll be brought to the job posting page. Fill out all the information for your job, such as the title, the experience required, the job description, etc. 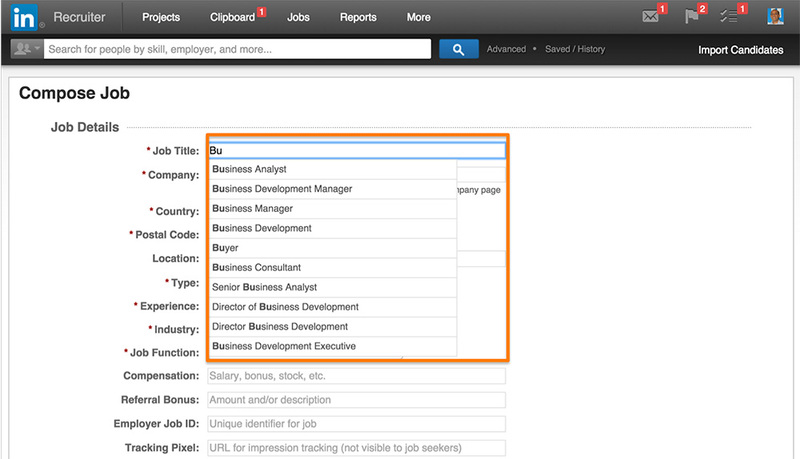 For the job title field, a type-ahead option allows to quickly select from a list of standard job titles. Make sure to pick a standard job title, if you can—that will allow our algorithms to work their magic to match your jobs to candidates with similar backgrounds. 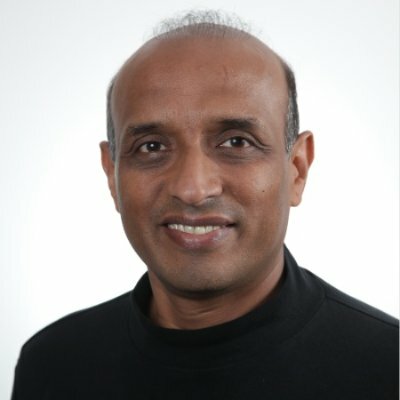 While “coding ninja” or “Java guru” may sound cool, you’ll likely get more relevant results if you simply say you’re looking for a software engineer and save your creativity for the job description. Next, if you have a company page on LinkedIn, you can complete that field. This ensures that your logo is prominently displayed in the posts viewed by LinkedIn members. Make sure you complete the other mandatory fields including country, postal code, type of opening (full-time, contract) and experience (associate, director, and so on). The Industry and the Job Function fields allow you choose up to 3 options. Take advantage of this as this will widen your search and you can reach more relevant candidates. It's important to note that the more of the job detail fields you fill in, the more of the right people will see your job ad thanks to our matching algorithms. Finally, make sure you complete the job description (more tips on this below), who the job poster is (if you are posting on behalf of someone else), and indicate your applicant routing plan (how and where to plan to collect applicant information). We’ve seen that companies that collect applications in Recruiter receive more applications than those that direct candidates offsite, so if you’re not sure, start collecting in Recruiter. When you’re done, hit the “Post Job” button at the bottom of the screen and your job is live. Along with appearing on the site, our recommendations engine will present to you up to 50 candidate profiles who best match your needs. The place to get creative is in the job description. Here’s some great advice on writing killer job descriptions. Same goes for job function. Again, you can select up to three job functions, so to get the most applicants, select three. Using the same example as before, you could put the job function as “writing/editing,” “art/creative” and “advertising." You can post the referral bonus amount in the job as well. Check out these tips on how to get more referrals without giving out bigger bonuses. Rich media content and recent updates from your LinkedIn Career Page is automatically piped into your job description when it’s posted. Just make sure your Career Page has all your latest content, and we’ll add it automatically so candidates have a better understanding of what it’s like to work at your company.